You’re driving in your car, you’re in a hurry and of course, the car in front of you is going really slowly. So you have another red light. You’re starting to get really angry and you say a lot of things to the person who, according to you, caused this. Because if that car in front of you hadn’t driven so slowly, you wouldn’t be waiting for the red light to turn green again. And you wouldn’t have been so angry now. It’s all the fault of that other car. But is it really? Is it the other person’s fault? According to the law of attraction we are responsible for everything we experience. Because what we send out is what we receive back, and whatever we give our attention to grows. If for example you feel angry, you will attract more situations that might make you angry. And if you are grateful for the happy things in life, even if they are really small, you will attract more things to be grateful for. When things happen that you don’t like that much, like the car that was too slow, you could ask yourself what the energy was that you sent out, so you received this experience. But it’s even more fun to try and turn this around. The first step is to become aware of the energy that you are sending out. Become aware of how you feel. Are you impatient? Angry? Sad? Disappointed? The second step is to accept this. Fighting against it will only bring you more of this, because what you give your attention to grows… So accept how you feel. It’s just like that. It’s not wrong or good. It just is. The third step is to think of something that will make you feel different, so you will start sending out a different energy. And therefore start attracting different situations. It’s not always easy if you don’t feel happy at that moment, but it is really possible! You could for example start by putting on music that you love. You’ll see that the not so happy feeling will go more to the background or will disappear completely. Something I often do, when I’m at home, is go into the garden. Especially with nice weather of course. I just go outside, with my feet in the grass. Connecting to the earth. Grounding. But of course everything you can think of that works for you is perfect. Everyone is different and you are one that knows you best and knows best what works for you. And you can try different things to find out what you like most. Now I know, that sometimes we are in a certain mood and we find that we have the right to be in this mood. The right to be sad, or angry, or something else. And of course we have the right! But tell me: Does that make you feel better? Does it make you feel happier? I don’t think so. Wouldn’t it be a lot nicer to find something that makes you feel better? Of course these things happen to me as well. And I remember a very special experience I had. I was sitting at the kitchen table, being angry and stubborn. In my head I was repeating all sorts of things and that made my anger and stubbornness even worse. I felt like the these feelings were stronger than I was. So I couldn’t help it, I thought. And then I heard a voice in my head: “You always have a choice”. Of course, I thought. But not now, not in this situation. And I continued being angry and stubborn. And then I heard it again: “You always have a choice”. Hmmm… maybe I should think about this… You always have a choice… Yes, it’s my choice to stay here at the kitchen table being angry and stubborn. I could also choose to go sit on the sofa with my love and let the thing that made me angry rest. That will make me feel better, and that is exactly what I want. Since that experience I repeat it to myself often. I say to myself: “Kirsten, you have a choice!”. And than I realise that I’m right. I smile and choose to do something else. Something that will change my mood and shift my energy. So if you don’t feel happy, no matter in what way, find something that will make you feel better. 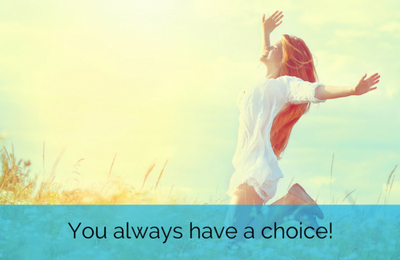 Nicer thoughts, daydreaming, listening to music, going for a walk… Tell yourself you always have a choice, and choose something that makes you happy! You will see that it will be easier and easier, the more you do it. And you’ll notice things will start changing in your life. Because you take the responsibility for what happens. Because you choose to feel as good as possible. If you'd like to focus more on the bright side of things, please join me in my new course 7 Days of Magic, a magical journey to a life full of fun! During one week we will focus on all the positive and happy things. I give you simple, but practical tools that you can easily apply. Imagine how your life will change if you start attracting more and more nice and happy things!